Do you love wearing colours on your nails but hate how they chip and need so much maintenance through the week? Me me me!!! One of my friends in America has been telling me about these new nail wraps called Jamberry. Quite frankly, she’s been obsessed with them for about 2 years now and is a sales consultant and raves about how much the not only loves the products, but also the company. 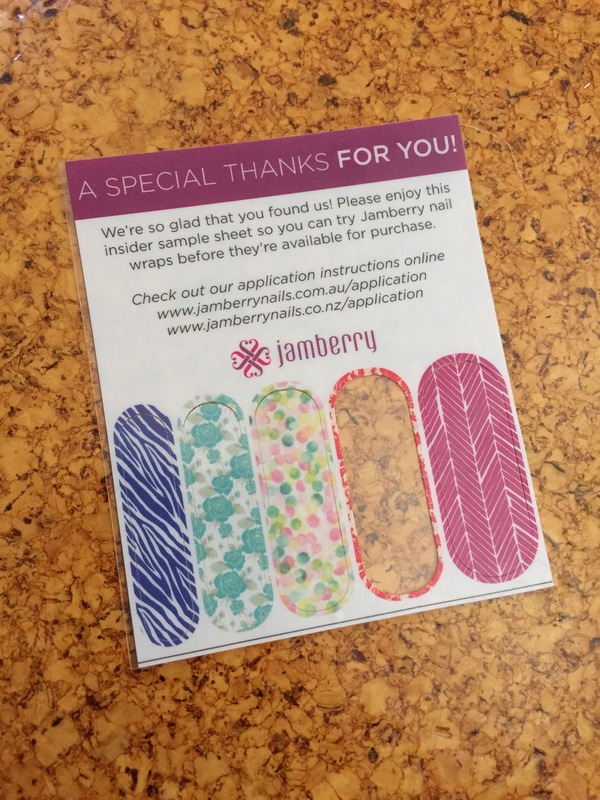 Jamberry Nail Wraps have just launched in Australia and I was given some samples to trial. The best way for me to explain them is like heat activated stickers that attach to your nails and stay on for up to 2 weeks on fingers and 6 weeks on toes. Basically they are stuck there and don’t move, chip or scuff…. It’s like a miracle! Clean unpolished nails with alcohol wipe (or just make sure they are completely clean and polish free) and push back the cuticles. Match nail (finger or toe) to the nail wrap that best fits. It’s really important that you choose the size that is a tiny bit smaller than your nail so that the edges of the wrap don’t touch your skin because that could make it peel off. 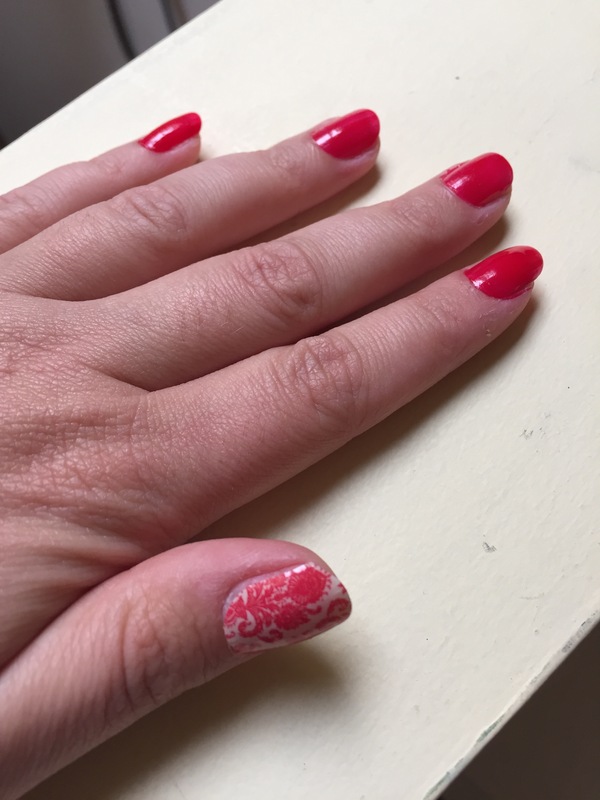 Jamberry says to peel off nail wrap and warm with a blow-dryer for 3-5 seconds or until soft and flexible, but there are many other ways to do it. I found that my dryer warped the wrap. You can also try stick on the wrap to your nail and then using a 5 second blast of blow dryer to set it on your nail. When warm, press the wrap onto the nail. Apply firm pressure around edges to adhere the wrap to the nail. If you have one, use rubber cuticle pusher to seal the wrap around the base of the cuticle, but rubbing your finger over it will work just as well. Trim the top with scissors and file off remaining wrap using a downward motion to remove excess. From googling, I can see there are numerous methods for removing the Jamberry Nail Wraps, but these are the 2 that the company recommends. Heat the wraps with a blow-dryer for 15 seconds. Then break the seal by getting under the edge of the wrap with your opposite thumbnail. Slowly peel the wrap from side to side. If the nail wraps are not peeling easily or the adhesive is still bonded to the nail bed, then follow the Gentle Removal Process. I HIGHLY recommend watching these videos before you apply your wraps. Ignore the mini heater and the alcohol wipes and extra gadgets they show you (they scared me into thinking I needed all kinds of gadgets to get them on but you don’t. All you need is a good nail file, a blow dryer and scissors). 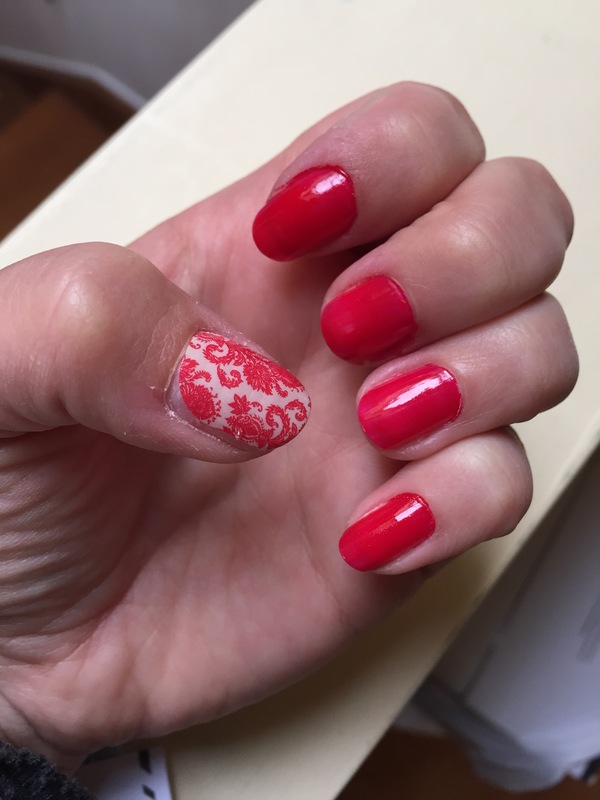 Here is how the Jamberry Nail Wraps looked when I applied them to my thumbs. Because it was my first time using them and trying to follow instructions, I kind of messed them up a little by overheating them I think, but nothing too bad. Just a few little bubbles at the side. They stayed on nicely for the week that I had them on and I know they could have stayed on longer if I wanted them to. 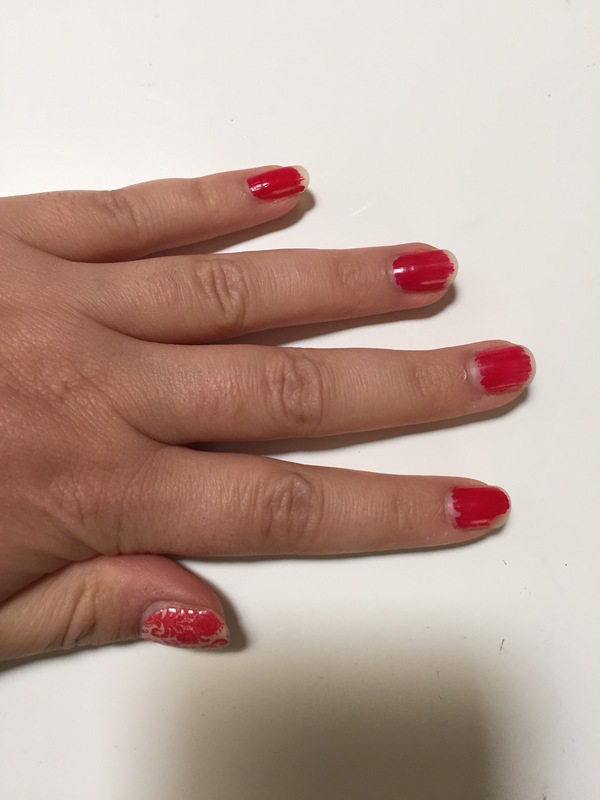 I painted my remaining nails with normal nail polish (Orly, Monroe Red), to show the comparison to how normal nails chip and how well Jamberry performs in comparison. You can see the nail polish definately chipped heavily but the Jamberry nail wrap held on. It was a bit scuffed on the top edge (mainly my fault for not filing it down properly as shown in the videos from the beginning. I know i’ll be better at that next time now I understand how it works). The side is also a bit ragged (also my fault from when I overheated them and didn’t press them down properly when I applied them and from me picking at the bubble at the side). Overall, I’m really impressed with how well the wraps stayed on and how they felt on my nails. I hardly knew they were there! Personally, I can’t stand having patterns on my nails and prefer plain block colours and thankfully Jamberry have plain colours too if you’re interested (although they are famous for their super cute patterned nail sets!). Who can be bothered spending hours doing nail art when you can just stick these little wonders on!! They release new patterns all the time like a new fashion collection and they even have sizes especially for kids tiny nails. Check out the cool wraps available this month here. Jamberry works via a personal consultant sales method (Think Avon and Nutremetics), so you need to make contact with your local consultant to purchase some or you can also buy online and pay a postage fee. The consultants are super enthusiastic and my friend Bianca has already signed up to be a consultant here in Australia because she loves them so much! You can contact and purchase Jamberry Wraps through Bianca and receive buy 3 get 1 free with free postage HERE!!! Occasionally consultants will throw you in a few extra goodies and samples to try so that’s a good incentive! There are also parties you can host (think Nutremetics and Tupperware but with nails). A pack of Jamberry Wraps costs around $22 here in Australia and that includes 2 sets of Manis, 2 sets of Pedis and some spares, but there are buy 3 get 1 free deals through consultants. Remember that they can last up to 2 weeks and will give you so much joy from looking at them. You’ll get so many compliments on the shiny patterned ones too! Win win!